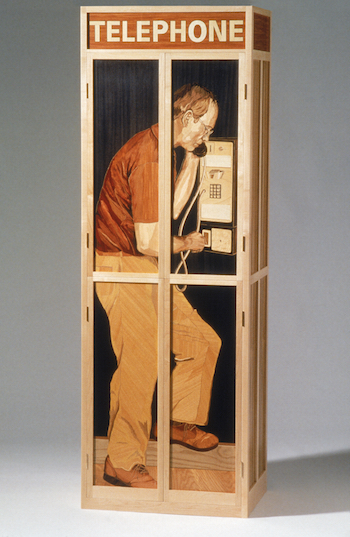 Telephone Cabinet (1993) has two pairs of doors with a life sized self-portrait covering most of the surface. My intent was to build something the size of an old telephone booth. I imagine that it won’t be long before anyone under twenty won’t recognize what this is. Making the marquetry telephone was a bit of a challenge with its shiny metallic parts and its regular geometry. Telephone Cabinet is in the collection of the Museum of Fine Art in Boston.